I am a big fan of guacamole and make it quite often. I have made this versatile dip in the past chunky and creamy, with diced tomatoes or without, with different kinds of citrus juice and seasonings. 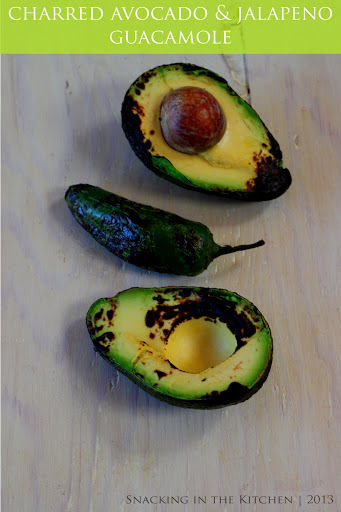 This time, I tried a new approach to guacamole – charred! 1. 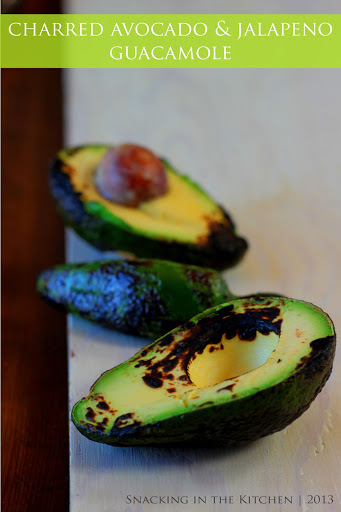 Char avocado and jalapeno over a gas flame. Hold avocado, cut side down, over a medium flame. Check often, and remove with tongs as soon as the flesh begins to char. You are not trying to cook the avocado. Similarly, rotate the jalapeno over the flame, getting a nice, even char over the skin. 2. 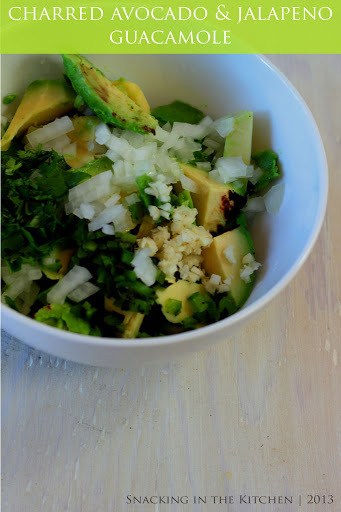 Scoop avocado into a bowl. Seed and finely chop the jalapeno. Use only as much jalapeno as you prefer, depending on the heat. 3. Mash avocado and jalapeno with the remaining ingredients. Leave it chunky if you wish, or mash until smooth. If you prefer a smooth consistency, I would advice adding cilantro right at the end. And there you go! 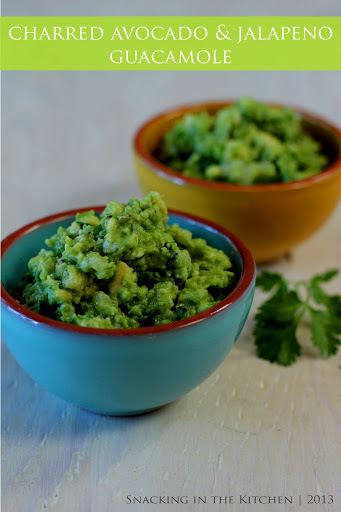 Charred Avocado and Jalapeno Guacamole. This is perfect as a dip with corn chips. If you would like more options, use the guacamole as a sandwich spread or thin it out with olive oil for a chunky dressing or marinade. If you are not eating the guacamole right away, cover it directly with plastic wrap to prevent browning and store in the refrigerator until ready to eat.